The Archie Comics revolution continues as 'Josie and the Pussycats' will be getting their very own updated series following modern takes on 'Archie,' 'Jughead,' and the upcoming 'Betty & Veronica' have reenergized the classic line of comics. Josie must get the band together for a shot at hitting it big in the music business as long as their manager's daughter Alexandra Cabot doesn't get in the way. Writing the new series will be Marguerite Bennett (Red Sonja) and Cameron DeOrdio with art by Audrey Mok (Heroine Chic). Check out the variant covers by Veronica Fish and Francesco Francavilla. 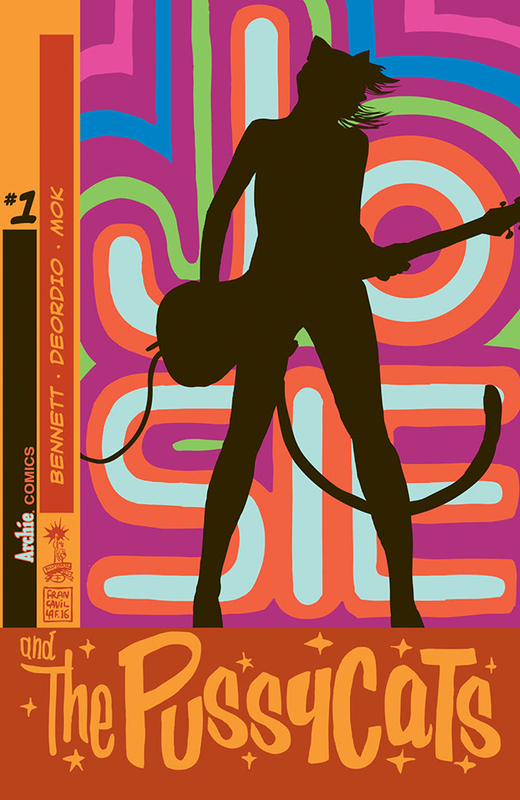 'Josie and the Pussycats' hits comic shops in September. 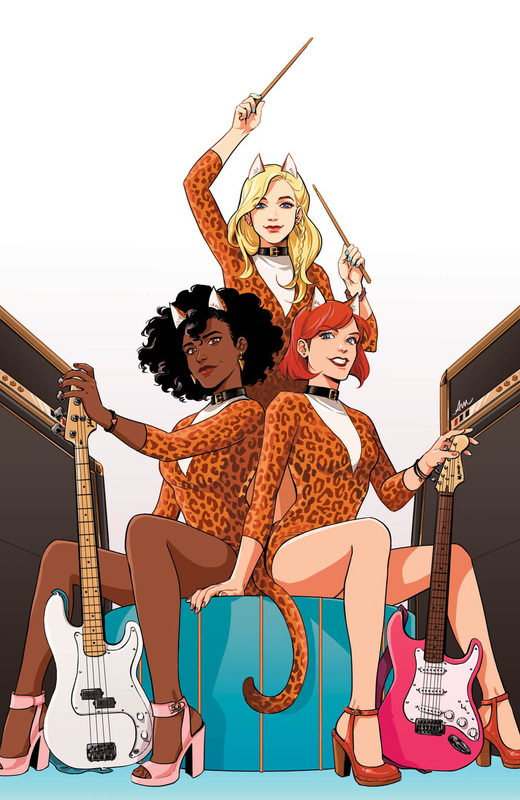 Together, they’re known across the world as the mega-famous rock band Josie and The Pussycats. JOSIE AND THE PUSSYCATS #1 launches on September 28th from the stellar creative team of co-writers Marguerite Bennett (DC Comics’ Bombshells), Cameron DeOrdio and artist Audrey Mok (Heroine Chic). 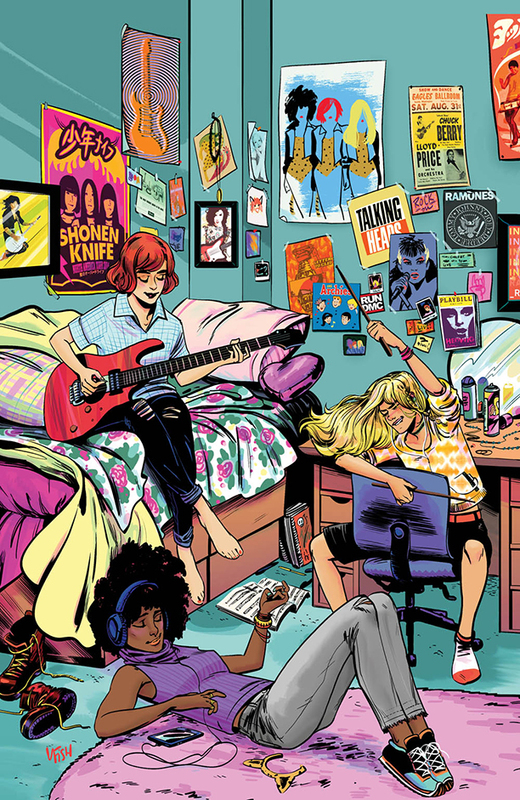 Fans have been demanding a new JOSIE AND THE PUSSYCATS series for years and Archie Comics is proud to deliver a new ongoing series that will follow Josie and her friends on their journey to achieve their dreams of musical stardom. Following hot on the heels of the blockbuster ‘New Riverdale’ re-launches ARCHIE and JUGHEAD series, and this July’s BETTY & VERONICA from Adam Hughes, the new JOSIE AND THE PUSSYCATS series will explore the foundations of the friendships between Josie, Valerie, and Melody and their rivalry with Alexandra Cabot. The new series will arrive in comic book stores this September featuring an assortment of variant covers from fan favorite artists including Veronica Fish, Francesco Francavilla, and more. Visit the official Archie Comics website for more information, follow us onTwitter and Facebook for the latest news and updates, and download theArchie App for iOS and Android to read all your favorite Archie Comics! GRAB THE LATEST, SUREFIRE TOP-OF-THE-CHARTS NEW RIVERDALE SERIES! Friends, countrymen, lend me your long tails and ears for hats—the Pussycats are back! In this series kick-off, Josie’s getting the band together to help achieve her dreams of musical stardom. But for the group to last, it needs a strong foundation of friendship and trust. Can the girls get going, or will Alexandra’s plotting put a stop to the whole thing? Don’t miss comics’ supreme songstresses’ return to the limelight in this exciting first issue! Variant Covers: Veronica Fish, Francesco Francavilla, and more!